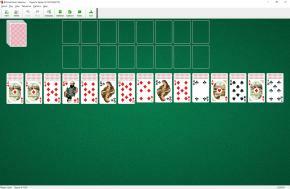 Gigantic Spider Solitaire uses four decks (208 cards). You have 15 tableau piles. 82 cards are dealt to these piles (6 cards are dealt to first seven piles and 5 cards to the remaining ones). The top card of each pile is face up. To build 16 sequences down in suit within the tableau (each running from King to Ace) and then move them to 16 foundations. The top cards of tableau piles are available to play. You may build tableau piles down regardless of suit, ending at the Ace. You cannot build a King on an Ace. One card at a time can be moved from pile to pile. 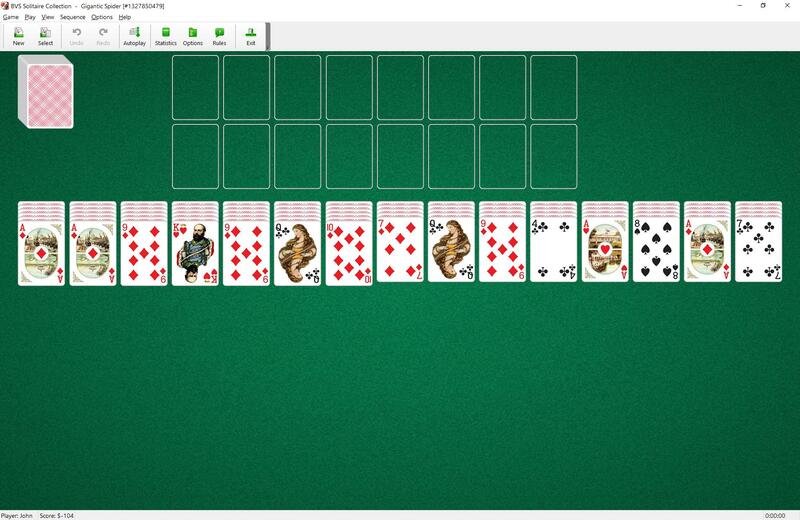 Groups of cards in sequence of the same suit may be moved as a unit. When any tableaus are empty you can fill the space with any card or group of cards. Gigantic Spider is 4 deck variation of Spider Solitaire invented by Boris Sandberg.